(a) Secure the tie rod assembly LH in a vise. (c) Flip the ball joint back and forth 5 times. 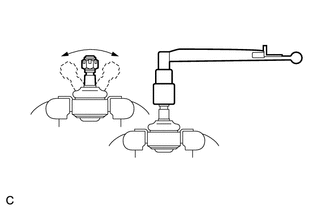 (d) Set a torque wrench to the nut, turn the ball joint continuously at a rate of 2 to 4 seconds per turn, and check the turning torque on the 5th turn. 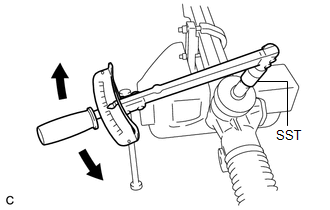 If the turning torque is not within the specified range, replace the tie rod assembly LH. (a) Using SST, secure the steering link assembly in a vise. (b) Using SST and a torque wrench, inspect the total preload. 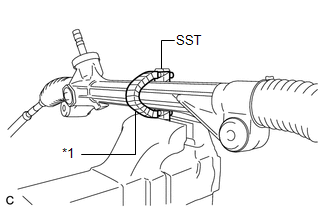 Inspect the total preload around the steering rack center position. If the total preload is not within the specified range, replace the steering gear assembly with a new one.